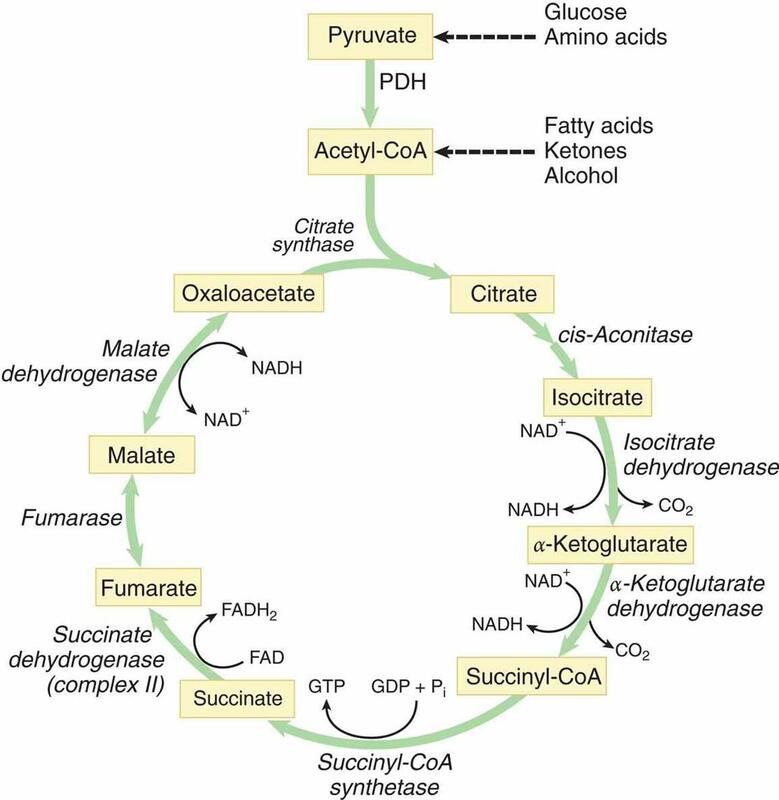 The citric acid cycle takes place in the mitochondrial matrix and begins with the coupling of a molecule of acetyl-CoA to a molecule of oxaloacetate. While acetyl-CoA is oxidized to carbon dioxide and both energy (GTP) and energy carriers (NADH and FADH2) are produced, the other substrates and products of the cycle are reused over and over again. Although oxygen is not directly required in the cycle, the pathway will not occur anaerobically. This is because NADH and FADH2 will accumulate if oxygen is not available for the electron transport chain and will inhibit the cycle. As we look at the individual reactions that take place during the citric acid cycle, it cannot be overemphasized that this process is exactly what it's called: a cycle, not just a series of reactions. An overview of the cycle is provided in Figure 10.4, and we'll take a deeper look at those steps below. Step 1—Citrate Formation: first, acetyl-CoA and oxaloacetate undergo a condensation reaction to form citryl-CoA, an intermediate. Then, the hydrolysis of citryl-CoA yields citrate and CoA–SH. This reaction is catalyzed by citrate synthase. As discussed in Chapter 2 of MCAT Biochemistry Review, synthases are enzymes that form new covalent bonds without needing significant energy. This second step energetically favors the formation of citrate and helps the cycle revolve in the forward direction. This reaction can be seen in Figure 10.5. Step 2—Citrate Isomerized to Isocitrate: achiral citrate is isomerized to one of four possible isomers of isocitrate. First, citrate binds at three points to the enzyme aconitase. Then water is lost from citrate, yielding cis-aconitate. Finally, water is added back to form isocitrate. The enzyme is a metalloprotein that requires Fe2+. In Figure 10.6, you can see that this results in a switching of a hydrogen and a hydroxyl group. Overall, this step is necessary to facilitate the subsequent oxidative decarboxylation. Step 3—α-Ketoglutarate and CO2 Formation: isocitrate is first oxidized to oxalosuccinate by isocitrate dehydrogenase. Then oxalosuccinate is decarboxylated to produce α-ketoglutarate and CO2, as shown in Figure 10.7. This is a very important step to know for Test Day because isocitrate dehydrogenase is the rate-limiting enzyme of the citric acid cycle. The first of the two carbons from acetyl-CoA is lost here. This is also the first NADH produced from acetyl-CoA in the cycle. Step 4—Succinyl-CoA and CO2 Formation: these reactions are carried out by the α-ketoglutarate dehydrogenase complex, which is similar in mechanism, cofactors, and coenzymes to the pyruvate dehydrogenase (PDH) complex. In the formation of succinyl-CoA, α-ketoglutarate and CoA come together and produce a molecule of carbon dioxide, as shown in Figure 10.8. This carbon dioxide represents the second and last carbon lost from acetyl-CoA. Reducing NAD+ produces another NADH. Dehydrogenases are a subtype of oxidoreductases (enzymes that catalyze a redox reaction). Dehydrogenases transfer a hydride ion (H–) to an electron acceptor, usually NADH or FADH2. Therefore, whenever you see dehydrogenase in aerobic metabolism, be on the lookout for a high-energy electron carrier being formed! Step 5—Succinate Formation: hydrolysis of the thioester bond on succinyl-CoA yields succinate and CoA–SH, and is coupled to the phosphorylation of GDP to GTP. This reaction is catalyzed by succinyl-CoA synthetase, as shown in Figure 10.9. Synthetases, unlike synthases, create new covalent bonds with energy input. Recall the earlier discussion about thioester bonds with regard to acetyl-CoA: they're unique in that their hydrolysis is accompanied by a significant release of energy. Therefore, phosphorylation of GDP to GTP is driven by the energy released by thioester hydrolysis. Once GTP is formed, an enzyme called nucleosidediphosphate kinase catalyzes phosphate transfer from GTP to ADP, thus producing ATP. Note that this is the only time in the entire citric acid cycle that ATP is produced directly; ATP production occurs predominantly within the electron transport chain. Citrate synthase doesn't require energy input in order to form covalent bonds, but succinyl-CoA synthetase certainly does. Pay careful attention to enzyme names: little things can add up to careless mistakes on Test Day otherwise! Step 6—Fumarate Formation: this is the only step of the citric acid cycle that doesn't take place in the mitochondrial matrix; instead, it occurs on the inner membrane. Let's look at why: succinate undergoes oxidation to yield fumarate. This reaction is catalyzed by succinate dehydrogenase. Succinate dehydrogenase is considered a flavoprotein because it is covalently bonded to FAD, the electron acceptor in this reaction. This enzyme is an integral protein on the inner mitochondrial membrane. As succinate is oxidized to fumarate, FAD is reduced to FADH2. Each molecule of FADH2 then passes the electrons it carries to the electron transport chain, which eventually leads to the production of 1.5 ATP (unlike NADH, which will give rise to 2.5 ATP). FAD is the electron acceptor in this reaction because the reducing power of succinate is not great enough to reduce NAD+. Step 7—Malate Formation: the enzyme fumarase catalyzes the hydrolysis of the alkene bond in fumarate, thereby giving rise to malate. Although two enantiomeric forms are possible, only L-malate forms in this reaction. Substrates of Citric Acid Cycle: Please, Can I Keep Selling Seashells For Money, Officer? Step 8—Oxaloacetate Formed Anew: the enzyme malate dehydrogenase catalyzes the oxidation of malate to oxaloacetate. A third and final molecule of NAD+ is reduced to NADH. The newly formed oxaloacetate is ready to take part in another turn of the citric acid cycle, and we've gained all of the high-energy electron carriers possible from one turn of the cycle. 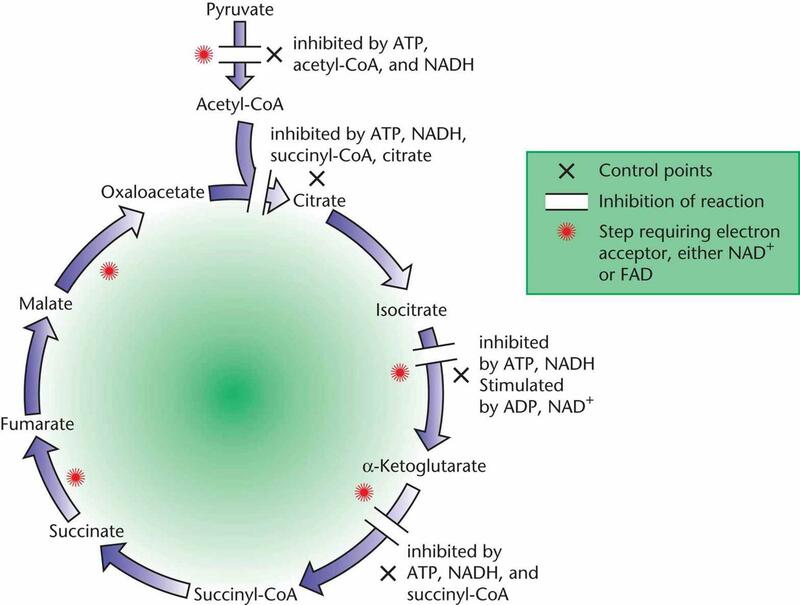 The last steps of the citric acid cycle—from succinate to oxaloacetate—are shown in Figure 10.10. Now let's take a step back and see what our net yield is from the steps we just took. Starting with the pyruvate dehydrogenase complex, recall that the products of this reaction include one acetyl-CoA and one NADH. In the citric acid cycle, steps 3, 4, and 8 each produce one NADH, while step 6 forms one FADH2. Step 5 yields one GTP, which can be converted to ATP. Two carbons leave the cycle in the form of CO2. Each NADH can be converted to approximately 2.5 ATP, while each FADH2 molecule can yield about 1.5 ATP. The total amount of chemical energy harvested per pyruvate as ATP is listed below. Glycolysis yields two ATP and two NADH, providing another seven molecules of ATP; thus, the net yield of ATP for one glucose molecule from glycolysis through oxidative phosphorylation is 30–32 ATP. Note that the efficiency of glycolysis varies slightly from cell to cell, so there is a range of ATP yield from one molecule of glucose. Let's say it's Test Day, and you see the following question: Which of the following is an inhibitor of isocitrate dehydrogenase? Before you start to panic, take a step back and use critical thinking. Where have we heard of isocitrate dehydrogenase—or merely isocitrate—before? The Krebs cycle. By knowing this, you can already make a fair attempt at such a question. Because energy (ATP) and energy carriers (NADH and FADH2) are products of this process, it makes sense that these molecules would have a negative feedback effect on the citric acid cycle. Always consider the big picture when faced with questions like these. For now, we'll outline how regulation occurs throughout the citric acid cycle; look for the recurring theme that energy products inhibit energy production processes. Even upstream from its actual starting point, the citric acid cycle can be regulated. The mechanism by which this happens is phosphorylation of PDH, which is facilitated by the enzyme pyruvate dehydrogenase kinase. Thus, whenever levels of ATP rise, phosphorylating PDH inhibits acetyl-CoA production. Conversely, the pyruvate dehydrogenase complex is reactivated by the enzyme pyruvate dehydrogenase phosphatase in response to high levels of ADP. By removing a phosphate from PDH, pyruvate dehydrogenase phosphatase is able to reactivate acetyl-CoA production. Acetyl-CoA also has a negative feedback effect on its own production. When using alternate fuel sources such as fats, the acetyl-CoA production is sufficient to make it redundant to continue producing acetyl-CoA from carbohydrate metabolism—that's why eating a high-fat meal fills you up so quickly! There are three essential checkpoints that regulate the citric acid cycle from within, and allosteric activators and inhibitors regulate all of them. The details of these mechanisms are outlined below and in Figure 10.11. · Citrate synthase: ATP and NADH function as allosteric inhibitors of citrate synthase, which makes sense because both are products (indirect and direct, respectively) of the enzyme. Citrate also allosterically inhibits citrate synthase directly, as does succinyl-CoA. · Isocitrate dehydrogenase: as we discussed in the beginning of this section, this enzyme that catalyzes the citric acid cycle is likely to be inhibited by energy products: ATP and NADH. Conversely, ADP and NAD+ function as allosteric activators for the enzyme and enhance its affinity for substrates. · α-Ketoglutarate dehydrogenase complex: once again, the reaction products of succinyl-CoA and NADH function as inhibitors of this enzyme complex. ATP is also inhibitory and slows the rate of the cycle when the cell has high levels of ATP. The complex is stimulated by ADP and calcium ions. Note that high levels of ATP and NADH inhibit the citric acid cycle, while high levels of ADP and NAD+ promote it. This isn't a coincidence! When energy is being consumed in large amounts, more and more ATP is converted to ADP, and NADH is converted to NAD+. It is therefore the ATP/ADP ratio and NADH/NAD+ ratio that determine whether the citric acid cycle will be inhibited or activated. During a metabolically active state, ADP and NAD+ levels should rise as ATP and NADH levels decline, thus inducing activation at all the various checkpoints described above, replacing the energy used up by active tissues. Before you move on, assess your understanding of the material with these questions. 1. What is the purpose of all the reactions that collectively make up the citric acid cycle? 2. What enzyme catalyzes the rate-limiting step of the citric acid cycle? 3. What are the three main sites of regulation within the citric acid cycle? What molecules inhibit and activate the three main checkpoints?